We all mourn the loss of our president Alberto Dines. Farewell, Dines! Stefan Zweig's name was on the Special Search List Great Britain, a secret list of prominent British residents to be arrested by the SS after a well-succeeded invasion by Hitlers troops. Astonishing news: 75 years after his death, Zweig overtakes modern bestsellers. Click to read. On the eve of the 75th anniversary of Zweig’s death, Zweigs only full-length novel, Beware of Pity, stages at the Barbican Centre in London. Click to read. The National Library of Israel has acquired twelve years of letters sent by Zweig to the young author Hans Rosenkranz between 1921 and 1933. The materials reveal Zweig’s sentiments on Judaism, alongside his belief in the importance of acquiring language skills. Click to read more. Thanks to the generosity of The School of Music at Fredonia, you will be able to access the events of the forthcoming symposium on Stefan Zweig and Richard Strauss clickking on this, which will lead you to the link YouTube channel whereby they broadcast many of their own events. The link for the events should be available just before the start of each (based on EST) from the School of Music's live stream site. 5 October, 6:00 pm (EST) - 4th Biennial Stefan Zweig Lecture given by George Prochnik, author of "Impossible Exile". The mayor of Benito Mussolini’s hometown Predappio, Prof. Giorgio Frassineti, will receive the Austrian Holocaust Memorial Award on Sept. 3rd, for his consistent stand against the influx of neo-fascists to Predappio. By the establishment of a documentation center, Frassineti aims to increase awareness about fascism and stop the Mussolini tourism. The Austrian Holocaust Memorial Award has been presented annually since 2006 by the Austrian Service Abroad, a partner organisation of Casa Stefan Zweig. 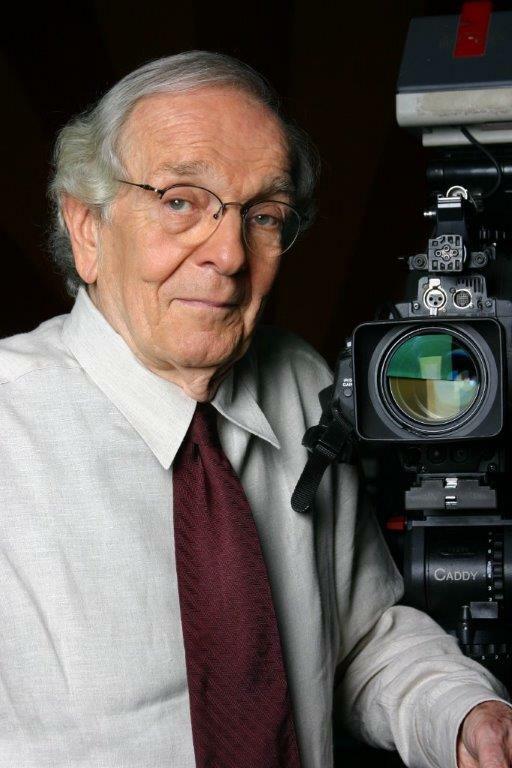 Alberto Dines, president of the CSZ, was awarded with the same prize in 2007 for his Zweig-biography Morte no paraíso (Death in Paradise). Strong winds, and the Alcantara takes longer to dock at the port of Rio de Janeiro. When the ladders are put down, the ship is already crowded with reporters and photograhers. Celebrity on board: only now the other passengers do recognize the famous writer who had stayed anonymous during 15 days ..., "writes Alberto Dines in his biography Death in paradise . August 21, 1936: Stefan Zweig first disembarks in Brazil, the same country where, five years later, he seeks exile - and decides to die. But he is more alive than ever. Come and visit the exhibition "Stefan Zweig lives." Friday to Sunday, 11h to 17h . The Archives & Special Collections of the Daniel A. Reed Library, State University of New York at Fredonia launched the weblog Zweig at Fredonia. 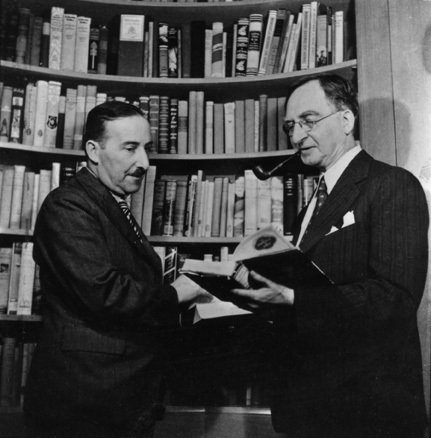 Intended to encourage the scholarship and appreciation of Stefan Zweig by promoting the extensive Stefan Zweig Collection at Fredonia, posts will also spotlight manuscript collections of Zweig materials from other repositories around the world and inform readers of Zweig-related conferences, symposia, exhibits and other events, both on the campus of Fredonia and at institutions worldwide. Click to enter the blog. The Center for Jewish History in New York offers researchers over 500,000 volumes and 100 million documents (in 23 languages and 52 alphabet systems). The collections also include artworks, textiles, ritual objects, recordings, films and photographs. 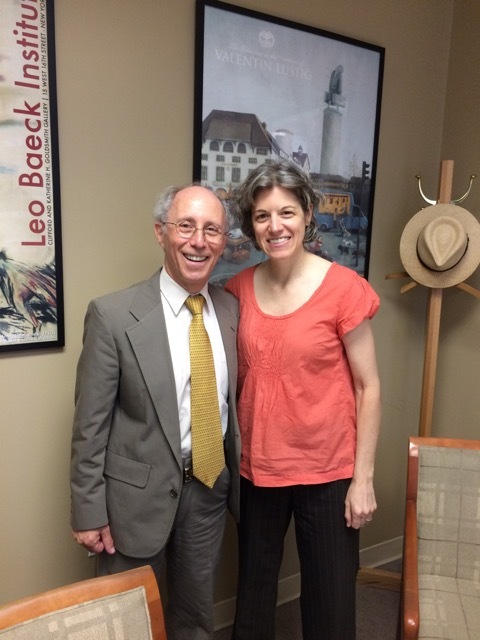 Our colleague Nancy Hartstein visited the Center and gave a short presentation on the Stefan Zweig House to Mr. Joel Levy, President and CEO of the CJH, and Ms. Laura Leone, Director of Archive and Library Services (see below), both admirers of Zweig's work. Both were very impressed that the book The Royal Game was written at Zweig's last home in Petrópolis. Correspondent Susann Kreutzmann visits Casa Stefan Zweig. Click to read her impressions (in German). Who is degenerate – the furious tyrant who abhors freedom or the artist moving towards truth? Who is degenerate – he who closes, hides and gags or he who opens windows and offers choices? Who is degenerate – he who beats, persecutes, tortures and kills or he who devotes himself to life? Who is degenerate – he who lives in darkness or he who offers light? The degenerate scares, expels, exiles: forbidden from practicing his art, the German expressionist Wilhelm Wöller fled his homeland, had his paintings vandalized, and died young. Thanks to the Junqueira family, Casa Stefan Zweig does its duty with the Memorial to Exile and presents the work of one among many artists who today would be better-known had degenerates not come to power. In responde to what is being called a new "zweigmania", Pushkin Press has for some years been working on an ambitious project: to bring Zweig's work to the attention of English readers. Sternstunden der Menschheit is now being launched in a new translation by Anthea Bell with the somewhat curious title of Shooting stars, 10 historical miniatures (originally there were 12 such miniatures). Click to read an article by Ian Sanson in The Guardian Book Review. Click to read the article in Le Figaro. A coleção invisível (The invisible collection), directed by Bernard Attal and inspired by Stefan Zweigs' novel, received four awards at the Gramado Film Festival. It was acclaimed as the best film by the Popular Jury and got the "Kikito" award for best supporting actress (Clarisse Abujamra) and best supporting actor (Walmor Chagas, the grat Brazilian actor who deceased last January). The Gramado Film Festival is the most important Brazilian film festival held annually in the city of Gramado, Rio Grande do Sul (south of Brazil) since 1973. This dramatic appeal by Romain Rolland to his pupil Stefan Zweig exactly 80 years ago today sends us back with surprising vigour to those dark times filled with hesitation and doubt. It is perhaps one of the most intense texts written by this figure, who was impregnated with nobility and humanity, author of Jean Christophe, and Nobel Prize winner in 1915. Rolland foresaw the Final Solution almost a decade before it was put into practice. He wanted a Jewish voice to stand up to denounce the trap. Stefan Zweig took two years to rise to his master’s appeal, his disgust at party politics – at the time being fought between Communists, social democrats and liberals in the struggle against Hitler – hindered him from recognizing the premonition contained in the appeal. In 1935, he prepared the minutes of a manifesto (the only one he wrote) to be signed by German-speaking Jewish intellectuals. He sent it to Albert Einstein and Max Brod, among others. It was filed away, unanswered. The full text of this manifesto is included in the volume of essays by Stefan Zweig, Mundo Insone, being launched in September by Zahar. Zweig rides high: two publishers from Rio are simultaenously launching the biogaphy Death in Paradise, by Alberto Dines (Rocco) and Marie Antoinette, by Stefan Zweig (Zahar). Due to Dines's ill health, the launch, which had originally been planned for this Wednesday, will be postponed two weeks. Click on this text to read the article published in Folha de S.Paulo on 15/4/2013. A giant chessboard was inaugurated on Saturday, April 20th, at Casa Stefan Zweig in Petrópolis, where the Austrian writer wrote his novella The Royal Game. The whole day was devoted to the "game of kings", with free admission for all ages. The public was able to play against Bruno Wilbert and Tiago Sobreira Barbosa, from the Petrópolis Chess Club, and Thauane de Medeiros, from Rio Grande do Sul, who in 2011 played against the world champion Garry Kasparov. Casa Stefan Zweig will offer a 3-month chess beginner's class on Saturdays, taught by Bruno Wilbert. The course is free and will provide certificates. Information: (24) 2245-4316 Friday to Sunday, 9 a.m. to 5 p.m. and (24) 8852-7820, Dora and Lúcia. See the article by Pedro Sprejer (in Portuguese) in the blog of the supplement Prosa & Verso of O Globo (Saturday, 13/4/2013): Alberto Dines organizes a collection of the Austrian author and launches a new edition of his biography of Zweig, who portrayed historical figures and was so delighted by Brazil. ...the books by the Austrian writer are also causing a stir. During a visit to Brazil and Uruguay, the German deputy Reiner Deutschmann (FDP) visited Casa Stefan Zweig in Petrópolis, and the tomb of Zweig and his second wife Lotte. Below, with CSZ manager, Dora Martini. Click to see Paraíso Utópico, a 52-minute documentary about Stefan Zweig, directed by Ricardo Miranda. The film is based on the book, Brazil, Land of the Future, in which the writer narrates his impressions about the country, its natural beauty, amiable people, miscegenation, the contrasts and the culture. Click to find Casa Stefan Zweig on the Culture Map of Rio de Janeiro, an inventory of cultural highlights from all over the state.The map is interactive: you can collaborate with more information about the state's artists, cultural spaces and patrimony. Twelve pannels and a series of films tell the story of the book that marked Brazil for ever. 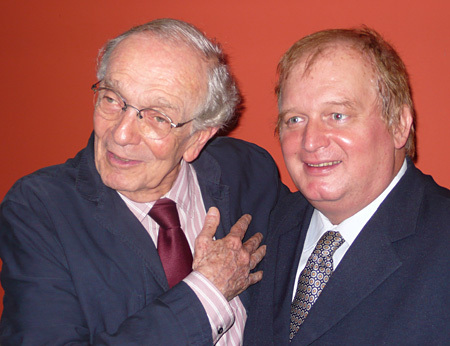 Curatorship: André Vallias and Alberto Dines. Friday to Sunday, 11pm-5pm. Commissioned by the University of Salford, the University of Salford presented the chamber operaStefan and Lotte in Paradise written by Salford academic and composer Alan Williams and Brazilian composer Marcos Lucas, which chronicles the last few months of the life of Austrian Jewish writer Stefan Zweig and his wife Lotte, who both committed suicide in 1942.The libretto by prize-winning playwright Philip Goulding deals with the themes of persecution, migration and exile. Click to read more. Read a 6-page-article by Leo Carey on Stefan Zweig in the New Yorker (August 27th) with the title The escape artist. Despite numbering fans from England manager Roy Hodgson to the celebrated authors William Boyd and Antony Beevor, the application to commemorate Stefan Zweig with a blue plaque on the London house in which he lived for five years has been rejected by English Heritage (click to read the complete article from Alison Flood in The Guardian). How must Stefan and Lotte Zweig have felt during the five months they spent in the narrow and rather humid bungalow at Rua Gonçalves Dias 34, fron September 1941 to February 1942? Click to watch a reenactment based on letters written by the couple to their relatives and to Zweig’s first wife and see rare images of Petrópolis in the 1940’s. 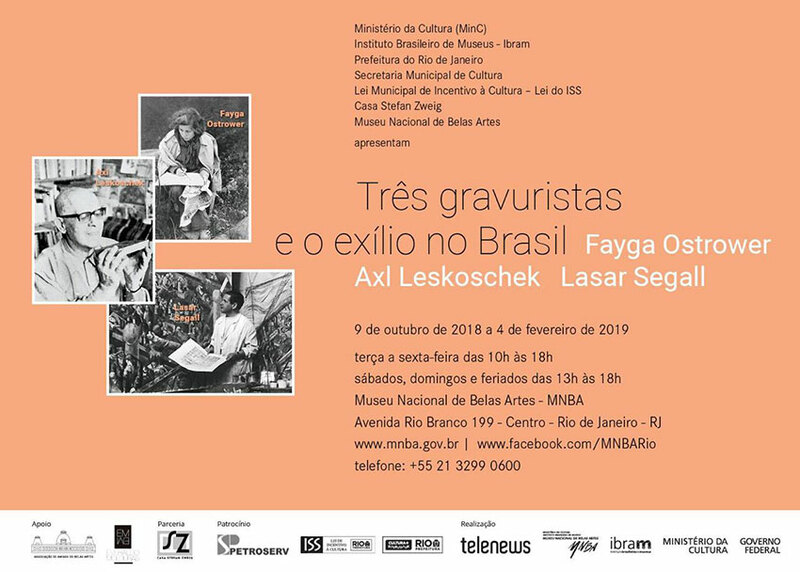 After over 5 years of works, the team at Casa Stefan Zweig is proud to announce the innauguration of its new cultural space in the last home of the Austrian writer, at Rua Gonçalves Dias 34, in Petrópolis on Saturday, on 28th July 2012. The new museum is open from Friday to Sunday from 11 pm to 17 am. CSZ has qualified to receive very important support from the government of the State of Rio de Janeiro through an agreement with the Secretary of Culture. A total amount of R$250,000 (around 100,000 Euro) will be disbursed over the next 24 months. The funds will go to financing projects such as workshops to train teachers and to serve students from municipal and state public schools. Click to read an article by Clive Davis on Stefan Zweig and Petrópolis. The museum Casa Stefan Zweig is almost ready and should open in July. The bungalow where the writer lived and died in Petrópolis, at Rua Gonçalves Dias 34, is in the final phase of reform, and still depends on funds which will come through fiscal incentive laws. Inside, the lighting, floor finishing, painting and office furniture are still missing. Click and see the photographic report on the work’s progress. Two composers, on opera.The genesis of the opera Stefan and Lotte in Paradise was in May 2010, when Brazilian composer Marcos Lucas visited his colleague Alan Williams in Salford University, UK. The story of Stefan Zweig was already well known to Marcos, as his wife’s family came from Petropolis, where Zweig spent the last 9 months of his life, in the house at Rua Gonçalves Dias. Gradually, the idea of creating jointly a piece of music theatre about Zweig’s Brazilian exile became reality. Click to read more. Antonio Augusto Mariante Furtado plunged into the world and life of Stefan Zweig. See the result (click). Kept in a plastic sheath at Israel’s National Library, a manuscript recalls the life of a writer who, after watching the European culture he worshiped devour itself in World War II, killed himself in exile exactly 70 years ago: on the 70th anniversary of his death (Feb. 23rd 2012) the National Library of Israel published online letters by Stefan Zweig including his suicide letter. The documents that can be found on the library’s homepage include correspondence Zweig held with famous authors as Albert Einstein and Sigmund Freud. “Before leaving the life of my own will and with a sound mind, I am impelled to carry out the duty: thank Brazil, this wonderful country which got me, as well as in my work, a rest so friendly and so hospitable. Every day I learned to love this country more, and I would not have asked to rebuild my life in any other place after the world of my own language sank and was lost to me and my spiritual homeland, Europe, destroyed itself. But to start everything anew after a man’s 60th year requires special powers, and my own power has been expended after years of wandering homeless. I thus prefer to end my life at the right time, upright, as a man for whom cultural work has always been his purest happiness and personal freedom – the most precious of possessions on this earth. I send greetings to all of my friends: May they live to see the dawn after this long night. I, who am most impatient, go before them." The whole team at Casa Stefan Zweig would like to pay tribute with admiration and love to Stefan Zweig’s Brazilian biographer and elder statesman of the Brazilian press, who today (19/2/2012) celebrates his 80th birthday. The greatest present will be the inauguration, in the middle of this year, of the project you not only dreamed of but also made come true: the Exile Memorial at the house where Stefan and Lotte Zweig lived and died 70 years ago in Petrópolis. <?xml:namespace prefix = o ns = "urn:schemas-microsoft-com:office:office" />On Friday 17th February the Argentinean newspaper La Nación published a long article about the 70 years since Stefan Zweig’s death, as well as the dramatic letter bidding farewell to the Chilean poet (and Nobel Prize winner) Gabriela Mistral, sent on 3/3/42 to the editor of the literary supplement of the same newspaper, Eduardo Mallea (click to read). Stefan Zweig was born on 28th November 1881 in <?xml:namespace prefix = st1 ns = "urn:schemas-microsoft-com:office:smarttags" />Vienna. Click to read a report (soon to be translated into English) about the place where the celebrated author spent the last months before putting an end to his life. 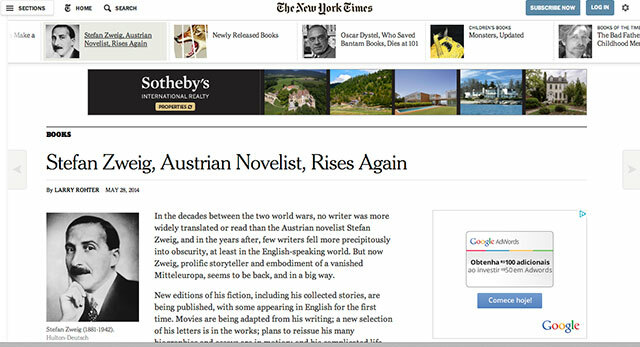 And click here to read two articles which appeared today in the Austrian media about Zweig and the 130 years since his birth. Click to read article on the new museum in Petrópolis. Written by the Brazilian correspondent Simon Romero, it was the most emailed article of the Foreign section of the newspaper and was also republished by the International Herald Tribune..
Zweigs memoirs, mailed to his publisher a few days before he took his life in 1942, describes Vienna of the late Austro-Hungarian Empire, the world between the two World Wars and the Hitler years.The eBook was produced by arrangement with Viking, a member of Penguin Group (USA) Inc and can be read on just about any device, Kindle, Nook, computer, tablet, smart phone, or other eReader. It is available worldwide on Amazon or Barnes & Noble. The highpoints of the annual meeting of the International Stefan Zweig Society (in Salzburg, from 30th September to 2nd October) were the presentation of the working manuscript of Maria Antoniette and the cooperation with the SZ Society of Holland. Click to see the programme (in German). Friendships with me are spoiled. That is the title of the correspondence between writers Joseph Roth and Stefan Zweig during the period 1927-1938, now published in Germany, organized by Madeleine Rietra and Rainer-Joachim Siegel and with a post face by Heinz Lunzer. Click to read a review in German. 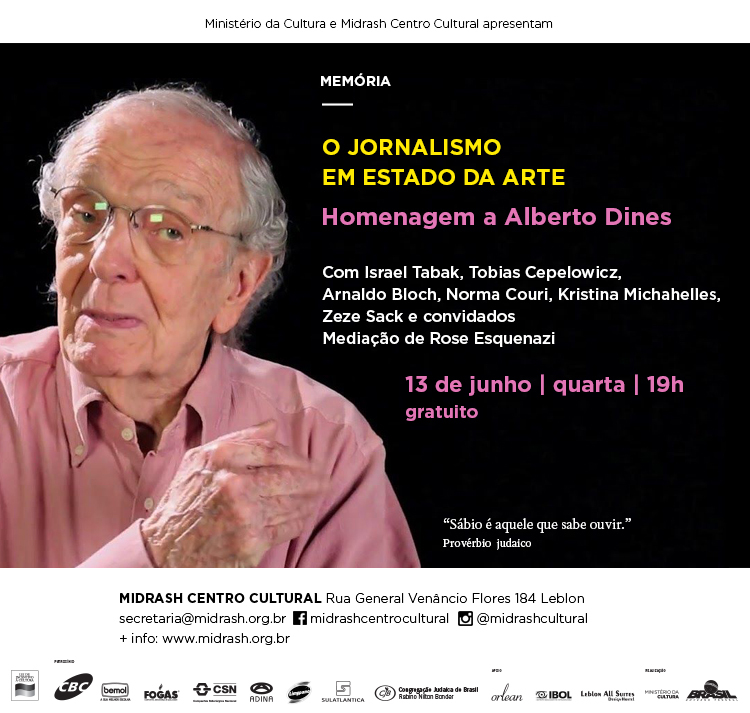 The programme has interviews with the historian Fabio Koifman, former president Fernando Henrique Cardoso and writer Affonso Romano de Sant'Anna. 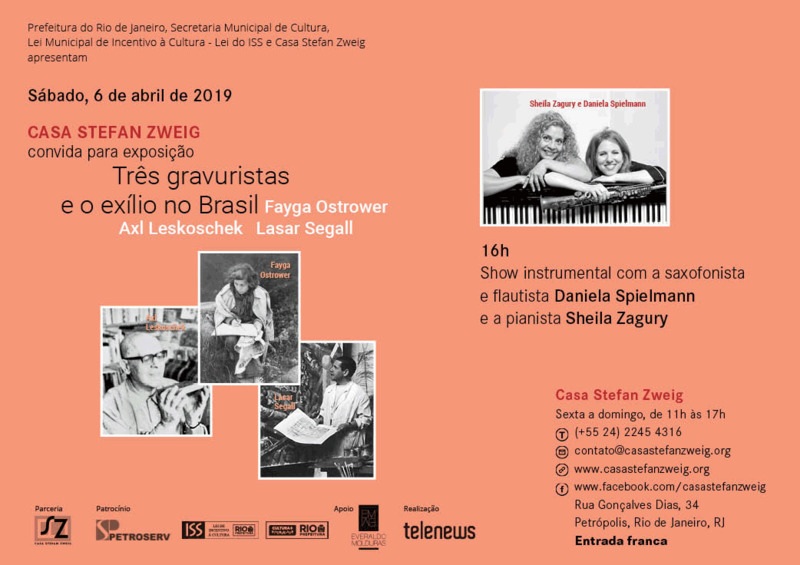 The CASA STEFAN ZWEIG initiative was presented on Saturday 27th August during the Colóquio Internacional Intermediações culturais Brasil/Alemanha in Paraty. During the panel Utopia and Exoticism the 70th anniversary of the book Brazil, Land of the Future was highlighted, and the difficult relationship between Zweig and Walter Benjamin was debated. It was in Paraty that Julia da Silva-Bruhns, Thomas Mann’s mother, spent part of her childhood. The plans to create a cultural centre in the house where she lived came up against various obstacles, as recounted in the article published in O Estado de S.Paulo (click – Portuguese only). A new and important book about German-speaking exiles in Brazil is available in Germany: Das Paradies ist überall verloren (lit. : Paradise is lost everywhere). The book is still being translated into Portuguese. Click to read the review (German only). The reform works at the house where Stefan and Lotte Zweig lived in Petrópolis are going full steam ahead. To put the house back in its original state from 1941, when the couple moved to Petrópolis, and adapt it to the function of museum, engineer Mario Azevedo and his team from M. Marc Arquitetura & Construção had to “strip it bare”, as can be seen in the series of photos in the report sent by the engineer. Mario Azevedo also photographed the museologist Priscilline Alto during the work of cataloguing the books and documents which will make up the CSZ archives. 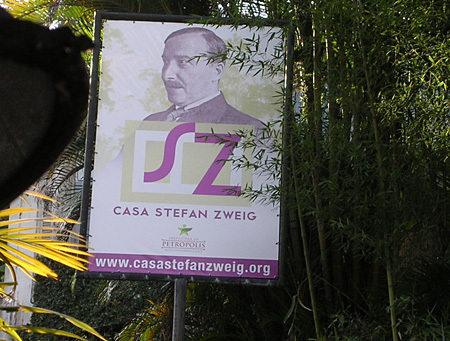 The Casa Stefan Zweig museum should open its doors to the public in March 2012. On 29th June CSZ received a very important donation: a bronze copy of Stefan Zweig’s death mask made by the sculptor Dr. Annibal Rodrigues Monteiro, who was also his dentist in Petrópolis. The piece was given by his children, Regina Maria Monteiro da Silva and Romolo Rodrigues Monteiro, and officially handed over to CSZ president, Alberto Dines, by the sculptor’s daughter. It will receive a notable place at the museum, which should be inaugurated by the end of the year in Petrópolis. 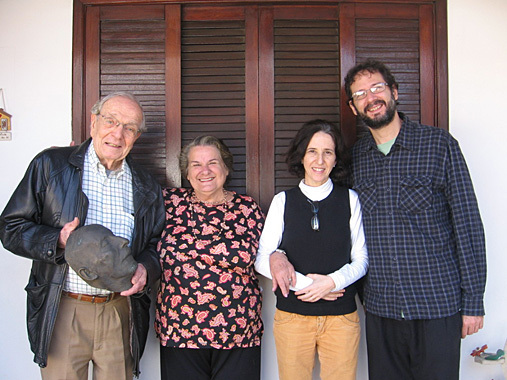 See below the death mast, the sculptor working on 23rd February 1942, and the donator, Regina Maria Monteiro da Silva, with Alberto Dines, Beatriz Lessa and Fabio Koifman, of CSZ. French author Laurent Seksik‘s fiction story Les derniers jours de Stefan Zweig was launched by Blessing Verlag (Verlagsgruppe Random House GmbH, Munich). It was translated by Hanna van Laak and the German title is Vorgefühl der nahen Nacht. The town of <?xml:namespace prefix = st1 ns = "urn:schemas-microsoft-com:office:smarttags" />Petrópolis has a commitment to the memory and history of Stefan Zweig, as reaffirmed by mayor Paulo Mustrangi during the official closing of the exhibition Stefan Zweig Vive! which, since its inauguration on 14th January, has received over 1,200 visitors. 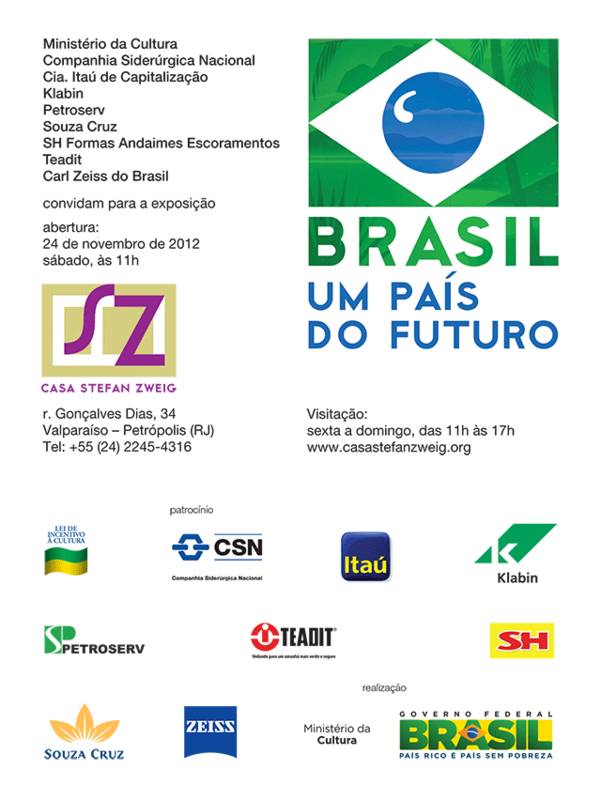 The ceremony was attended by a large audience and personalities such as the president of Fundação de Cultura e Turismo de Petrópolis, Charles Rossi, who praised the cooperation with Casa Stefan Zweig, and the Austrian ambassador, Hans-Peter Glanzer, who highlighted the dichotomy between euphoria and despair, the Brazil of the future and the world of yesterday in which the Austrian writer lived. Afterwards there was a joint lecture by the president of CSZ, Alberto Dines, and the pro-rector for Cultura e Extensão at Universidade Estácio de Sá, the writer Deonísio da Silva, who is finishing a book about Lotte, Zweig’s second wife, to a packed Afonso Arinos Auditorium. For nearly two hours, the audience had the chance to discover details of the writer’s life and work. 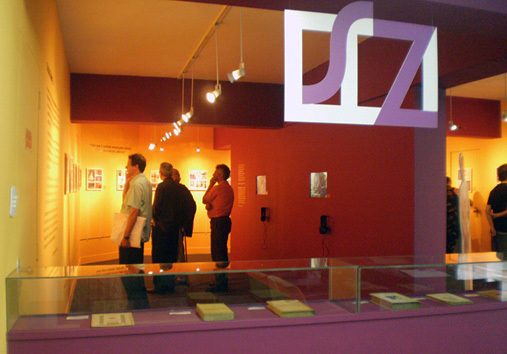 The exhibition Stefan Zweig Vive! can be visited until next Sunday, 1st May, and should move to Rio de Janeiro during the second semester. The inauguration of the Casa Stefan Zweig museum is planned for the end of this year. 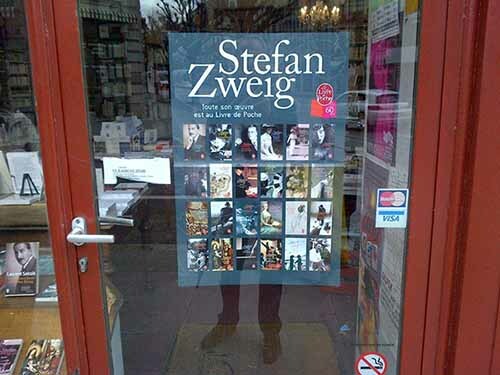 i>Stefan Zweig lebt ! (*), Stefan Zweig lives. And he has done ever since he died. His “afterlife” has exceeded the six decades of his life by eight years. The epilogue to his biography is now far greater than a mere chapter and has become its own book, as rich as his tumultuous existence. The war destroyed him in 1942 and the peace of 1945 resuscitated him in the four corners of the world. Since then he has become the protagonist of a series of revivals involving his fiction, the subjects of his biographies, causes he defended and the insights recorded in his memoirs, essays, diaries and letters. He may not be part of a social network like Facebook, but his vast network of friends and correspondents have made him a supporting role in innumerable biographies and memoirs. (Click to read full text). Click to read the presentation held by Alberto Dines on bis book Stefan Zweig in the land of the future, which happened July 28th n Salzburg, Austria. Photo: privately owned by Jeffrey B. Berlin..
Click here to read an article by Stephen Maughan in the magazine Fine Books & Collections. 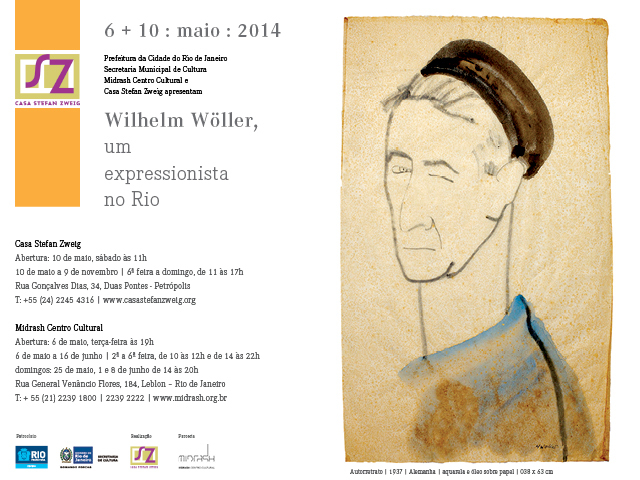 Correspondent Wolfgang Kunath writes on the future Zweig-museum in Petropolis (in German). In a speech to the Knesset last Monday (15/3), President Lula criticized Israel’s expansionist policies, and recalled: "I come from a country which received thousands of Jewish immigrants, persecuted in their homelands by ethnic, cultural and religious intolerance. Many were able to reach Brazil thanks to two humanist employees who are an honour to Brazil diplomacy: Dona Aracy, of the Hamburg Consulate, and ambassador Souza Dantas, from our Paris legation." Read more about Luiz Martins de Souza Dantas, the diplomat who for years was ostracized until his memory was recovered by historian Fabio Koifman, a CSZ team member. The president of the Festival of Salzburg, Helga Rabl-Stadler, accompanied by the musical director Markus Hinterhäuser, went to Petrópolis on 5/3/2010 to visit the house where Stefan and Lotte Zweig lived. The novella Fear is being dramatized this year at the Landestheater in Salzburg as part of the celebrations for the traditional cultural festival’s 90th birthday. This year it runs from 25th July to 30th August (see programme). what fierce criticisms he provoked among his peers. For months now, Zweig’s books have been heading the French bestseller lists. His previously untranslated book Journey into the Past has sold over 200,000 copies since its launch in October 2008 (half of these in the first two months alone). This peak in sales has encouraged numerous reprints of books by the writer and his biographies. So it is no rare sight to see people on the Paris metro engrossed in one of Zweig’s books. According to one critic, Zweig’s enduring success among the French is due to the fact that he carries out an “archeology of our souls”. Surprises from the internet: through the CASA STEFAN ZWEIG website, the Portuguese engineer Henrique Marques dos Santos discovered the book by Belgian writer Rosine de Dijn about her father, Captain Américo dos Santos. The Ship of Destiny tells how, during the whole of World War II, Américo dos Santos commanded the ship Serpa Pinto across the treacherous waters of the Atlantic, transporting both Jewish refugees and Nazis returning to fight among Hitler’s troops. Click here to read the review by Marlen Eckl of the book, which is being translated into Portuguese by Marina and Kristina Michahelles and is due to be published in the second half of this year by Editora Record. And click here to read the e-mail we received from the captain’s son..
On 12th January, at the age of 84, a refugee of World War II died who became a famous doctor in the country which took him in: Dr. Juljan Czapski (or just “doctor”, as he was known). Born in Poland, he came to Brazil at the age of 14 and was the great pioneer of “group medicine”. Dr. Juljan also contributed to such varied fields as culture and the environment. According to his daughter, journalist Silvia Czapski, who is writing a book about him, “Dr. Juljan had even more plans and projects than I do. I’ve been amazed these past months by the number of people commenting on his integrity, his struggles and ideas, his realizations and battles for a more just world.” Read more about the saga of the Czapski family’s arrival in Brazil. The fourth and last episode – The Refugees in the Land of the Future – in the special series marking the 70 years since the beginning of the Second World War made by Observatório da Imprensa on TV Brasil, was broadcast on 1st December, with interviews with exiles who came to Brazil and historians. 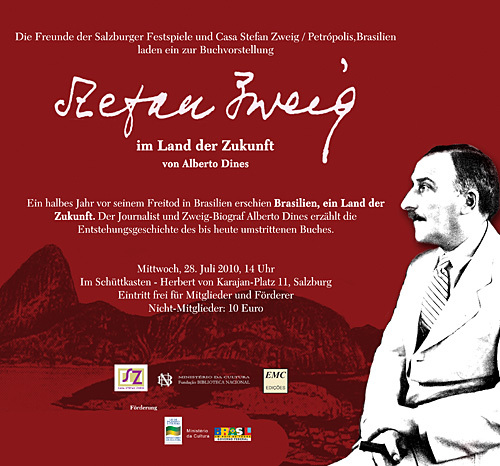 In the program’s introduction Alberto Dines spoke about the drama of Stefan Zweig, the most famous European refugee to seek shelter in Brazil during the war. Click for more details about the series and to see the various episodes. 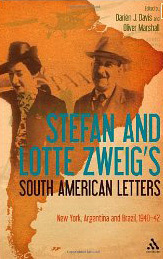 How many letters did Stefan Zweig write during his lifetime? A selection of his general correspondence fills four heavy tomes, and the letters to his first wife is extensive. It comes as no surprise that a collection has surfaced of five unpublished letters addressed to an unknown cousin in Israel. See comment by Alberto Dines and the news of the letters in the Haaretz newspaper. Brazil, land of the future still stirs up hearts and minds. The prestigious supplement Mais+ from the newspaper Folha de S.Paulo of October 181h is entirely dedicated to this book of the Austrian writer. 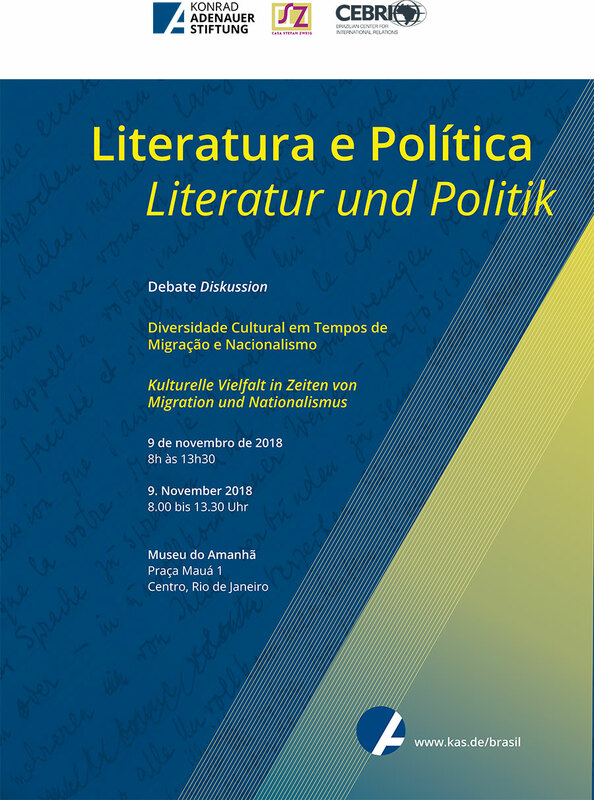 Go to Stefan Zweig and Texts to look up the essays (in Portuguese language) by historians José Murilo de Carvalho and Ronaldo Vainfas, do anthropologist Hermano Vianna and sociologist Maria Alice Rezende de Carvalho, among others. The new video about the history of the CASA STEFAN ZWEIG initiative can be seen on line. Go back upwards at the green column on your right side and click. A symposium on Zweig and his transatlantic connections brought together sixteen European and American specialists during three days at the State University of New York in Fredonia. The historian and specialist in Exile Literature, Marlen Eckl, held a conference during the event and showed a video about CASA STEFAN ZWEIG. Marlen Eckl is the German translator of the biography Morte no Paraíso, by Alberto Dines. At Fredonia Opera House, film-maker Sylvio Back screened his feature film Lost Zweig and talked about “The Unfathomable Gesture”. He also launched the bilingual edition (Portuguese and English) of the film’s screenplay (Imago, 2008). The University of Fredonia has the largest iconographic Zweig archive in the USA, which was opened in 1981, the centenary of the author’s birth. Click to read two articles published by the local Observer. It is with great sadness, and also deep gratitude, that CASA STEFAN ZWEIG announces the generous donation of the exile literature received by the family of the Germanist professor Izabela Kestler, tragically killed in June in the Air France plane crash. Our special thanks go to her husband Milton Correa Lopes Junior, her sister Izana, and her parents. With this gesture, they allow the precious collection of books, magazines, manuscripts, letters and tapes with original recordings of German speaking refugees in Brazil, to become accessible to researchers in this country and all over the world. The material is already being catalogued and will be part of the future archives of CASA STEFAN ZWEIG in Petrópolis. The team that is building the Memorial to Exile, under the coordination of historian Fabio Koifman, is now seeking sponsors in order to be able to digitalize the recordings and to organize the Izabela Kestler Fund. We pay our posthumous tribute to the researcher who, working tirelessly for over two decades, carried out such vital work for the memory of the history of exile in this country. 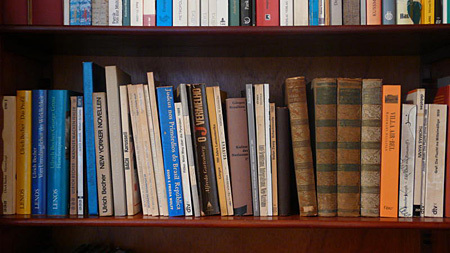 Click to see a partial list of the titles being catalogued. "A new world of visual stimuli"
Many readers have been writing us, telling how Zweig´s work influenced their lifes. The drawings by André Tavares (china ink, graphite and soft carbon - see below) are part of the series Confusion (Verwirrung der Gefühle). 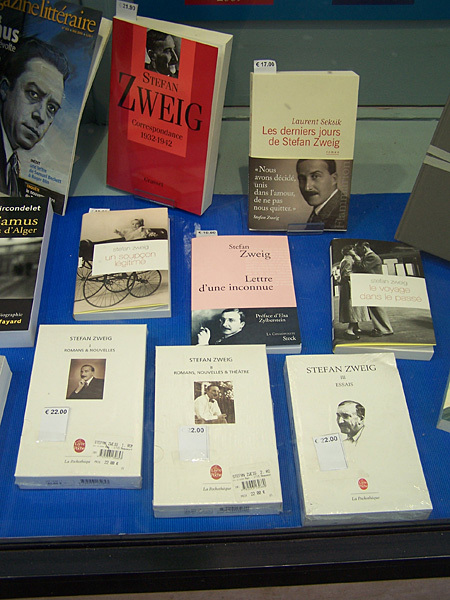 The source of Tavares' inspiration are Zweig's novels, his biography and the pictures of Lotte and Stefan in Brazil. "I've been working with the mountain landscape of Petropolis and spreculating about the Zwei's encounter with that rather magical nature - a new world of visual stimuli", writes Tavares, a professor for History of Art at the Federal University of São Paulo. Click here to enter the gallery of photographs of the Zweig home in Petropolis, showing Stefan Zweig, his friends and relatives. Similar to Stefan Zweig, the French philosopher, sociologist, historian and economist Edgar Morin also believes that Brazil is "the nation of the future", if it could only overcome its major obstacle: corruption. Morin suggest a reform in the field of education, based on transdiscipline and on the principal of solidarity. Similar to Zweig's conclusions, Morin says Brazil's advantage in relation to the rest of the world is in its racial mix and the biodiversity in the Amazon. If the country knew how to best take advantage of these qualities, he assures, it could assume world leadership in reformist projects which would result in "multidimensional changes conducted by men of good will to creates a new civilization." Click to read the complete interview which Edgar Morin gave to the newspaper (in Portuguese language). The long correspondence between Stefan Zweig and Hermann Hesse, two pacifists and great Europeans, during more than three decades, and the memories of his first wife Friderike have just been published in Spain. Click to read the review (July 4th, 2009) in the literary supplement of El País. Due to his Jewish origin, Stefan Zweig lost his "Dr. phil." in 1941, which he had gained in 1904 at the Vienna University with the dissertation The philosophy of Hyppolite Taine). It was only in 2003, 60 years after the end of Nazism, that the University of Vienna gave him the title back posthumously. It contains roughly 2,200 names and short biographies of victims who were persecuted, driven away and/or murdered - as jews and/or for political reasons, professors, lecturers and students. The project is a 'work in progress'. By a wide online linking of the data base the intention is to reach more persons concerned or their affiliates and ask them to complete the contained information. Forum 'History of the Vienna University in the 20th century'. The Pushkin Press of London, which is re-editing Zweig's works, informs us that the launching of the book Journey into the Past on 25th June at the Austrian Cultural Forum in London was a total success attracting packed houses. "On Thursday 25th of June Pushkin Press held the launch at the Austrian Cultural Forum in London, which was a great success and full house. The translator Anthea Bell gave a presentation, chaired by the writer Paul Bailey who provided a wonderful introduction published in this edition of Journey into the Past, Laura Hugo of Pushkin Press writes us. Pushkin Press will also launch in November The World of Yesterday. In January 2010 it expects to launch Fear, both in translations by the prize-winning Anthea Bell. The magazine's cinephile and blogger follows Stefan Zweig to Europe between the wars and comments his autobiography The World of Yesterday. Read the article by Julie Kavanagh in More Intelligent Life, a supplement of The Economist. CASA STEFAN ZWEIG took part in German Language Day in Petrópolis on 17th June, with a talk by Alberto Dines at the Imperial Museum. Organized by the Catholic University of Petrópolis, the aim of the event was to share aspects of the history, education and new perspectives of Austria and Germany, and was attended by the Austrian Consul, Peter Waas. 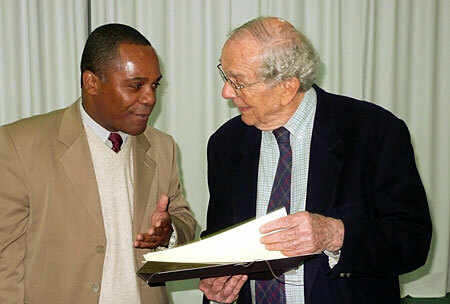 Pictured, Alberto Dines and the director of the Imperial Museum of Petrópolis, historian Maurício Vicente Ferreira Júnior. Click to enter the site of the symposium about Zweig, which will take place in October in Fredonia, NY. The CASA STEFAN ZWEIG initiative will also be presented. Deeply shocked by the tragic crash of Air France flight 447, the team at CASA STEFAN ZWEIG shares the grief felt by the family, friends, students and colleagues of professor Izabela Maria Furtado Kestler. Author of a fundamental work, Exile and Literature, São Paulo: Edusp, 2003 – Izabela Kestler enthusiastically supported CASA STEFAN ZWEIG right from the start, and was a member of the Archives and Research Commission. Click to see the notice published by the German Society for Research about Exile. Over a hundred people came to the Brazilian embassy in Berlin on 4th July, to hear about the project CASA STEFAN ZWEIG and the book Stefan Zweig in the Land of the Future, by Alberto Dines. The book was also presented in Munich and Hamburg. 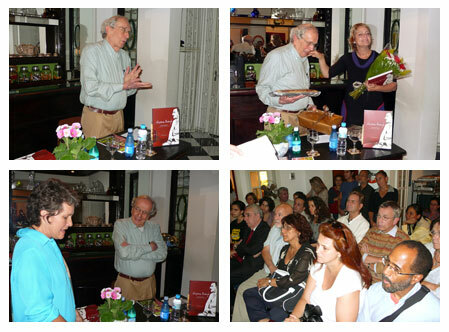 Below, photos of the author’s talk on 20th May before a varied audience at the Baukurs Jardim Botânico. Read the text (in Portuguese, soon to be translated) by Alberto Dines, written for the closing session of the 21st National Forum, Rio de Janeiro, from 19th to 21st May 2009 at BNDES. One of the greatest specialists in German exile literature, professor Jeffrey Berlin, has highlighted the diversity of new aspects raised by the book Stefan Zweig in the Land of the Future. Read the full e-mail sent to Alberto Dines. Three schools – one in São Paulo, another in Petrópolis and the third in Endingen, southern Germany – have been named after the Austrian writer. 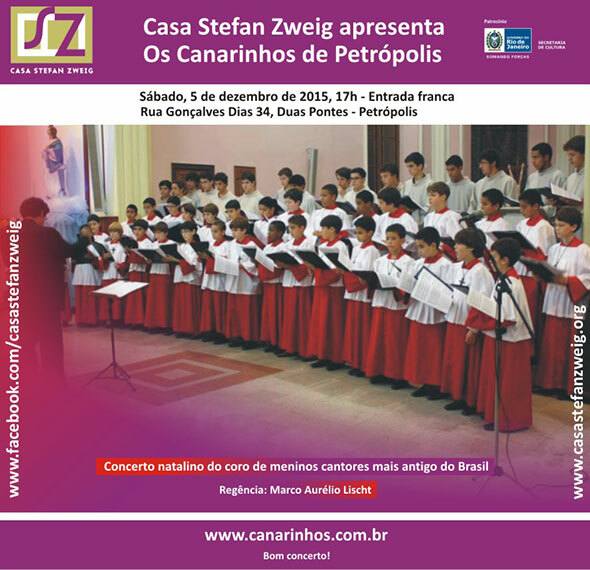 CASA STEFAN ZWEIG will introduce them one by one, starting with the Stefan Zweig State School in São Paulo. The May edition of Magazine Littéraire devotes its cover to Stefan Zweig and contains a 26-page dossier about the writer, with unpublished photos and an unpublished text about “The United States of Europe” (written in 1932). The literary supplement of Jornal do Brasil, Deutsche Welle online and journalist Luciano Trigo’s blog all highlighted the new book by Alberto Dines, Stefan Zweig in the Land of the Future. Click for more. The team at CASA STEFAN ZWEIG offers its condolences to the family, friends and colleagues of the Austrian consul Reinhold Steinberger, who passed away on 30th April in Ica, Peru. The consul general in Rio de Janeiro several years ago, Steinberger was an early enthusiast for the idea to reform the house where Stefan Zweig lived and died in Petrópolis. He always supported the initiative. He opened up his residence for the official launch of the CASA STEFAN ZWEIG project, in 2006. A week earlier, at the same house, in the presence of ambassador Hans-Peter Glanzer, he hosted the ceremony in which the president of CSZ, Alberto Dines, received the Austrian Order of Merit for Science and Arts. Steinberger died suddenly at the age of 55 in a car accident. His wife Jane Steinberger, who was accompanying him on the trip to see the Nazca lines, was trapped in the wreckage, but suffered only grazing. Reinhold Steinberger was buried a few days later in Austria. He is survived by his wife and two children. "Utopia or myopia, political project or travel brochure – Brasil, a Land of the Future, by Stefan Zweig, has little consensus to this day. It is debatable, an open question. One thing is certain: rarely has a travel book managed to produce such a broad range of admirers." This is the opening of Stefan Zweig in the Land of the Future – the biography of a book, by Alberto Dines, journalist, Zweig’s biographer and chairman of CSZ. ...and read the speech by the Austrian ambassador, Hans-Peter Glanzer. In a message of congratulations, the director of the International Stefan Zweig Society, Hildemar Holl, shares his wish to strengthen ties between the new Stefan Zweig Center of Salzburg and CSZ. 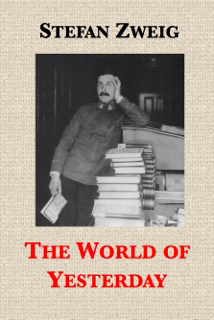 A symposium from 1st to 3rd October at the University of Fredonia will discuss Zweig’s life and work, emphasizing his transatlantic connections. During the event, the film Lost Zweig by Sylvio Back will be shown. Contact: Birger Vanwesenbeeck via e-mail vanweseb@fredonia.edu. It will be possible to stay on after the symposium to research in the university’s Zweig archives, one of the world’s most comprehensive collections about the writer. A book by Stefan Zweig which was only published posthumously, Postfräuleingeschichte is in the list of best translations of 2008 chosen by the New York Review of Books: The Post-Office Girl, translated by Joel Rotenberg. Refugees of Nazi Germany coming from Lisbon to Brazil. Germans returning to fight alongside the Führer in the homeland. A book tells the fantastic saga of the passenger ship which spent the entire war crossing the Atlantic. The review is by researcher Dra. Marlen Eckl. Rosine De Dijn narrates the adventurous story of the Portuguese luxury cruiser Serpa Pinto, highlighting the disasters and absurdities of World War II. In spring 1942, the Serpo Pinto brought German National Socialists living in Brazil and keen to fight for the "Führer" and fatherland back to Europe. At the same time, this ship became the last hope of escape for Jewish refugees. In 1942 the Serpa Pinto plied the fateful Atlantic route Rio de Janeiro – Lisbon – New York. The passengers on the ship of Captain Americo Do Santos could hardly have been more different. On the way from South America to Lisbon, the Serpa Pinto would take German expats who had emigrated to Brazil during the years of inflation and economic crisis "back to the Reich", where they wanted to go to war for Hitler. The journey from Rio de Janeiro to Lisbon was a luxury cruise compared to the Atlantic crossing in the opposite direction. This time, the Serpa Pinto became the last hope, the final escape for hundreds of refugees leaving Europe via neutral Portugal. The story of the Serpa Pinto shows – in a kind of micro cosmos – the dramas of the Second World War. On the one hand there was the fanaticism of National Socialism, which went to such extremes that people left the security of their homes in Brazil to set off for war-shaken Europe. On the other hand, however, there were people who had irrevocably lost their homes and roots and become refugees. The newspaper taz, published in Berlin with a daily print run of 45,000, has devoted a page to Stefan Zweig and to his house in Petrópolis. Journey into the Past, the love story, has become a big seller in France, where 43 titles by Zweig are available in paperback, with a total of 4 million copies sold. The biggest seller continues to be The Royal Game, with 900,000 sales (it is regularly adopted in classrooms), followed by Twenty-Four Hours in the Life of a Woman (530,000), Beware of Pity (350,000) and Amok (300,000). See a review about Zweig’s novella published in Le Figaro in December 2008. The exhibition catalogue Navio de emigrantes (Ship of Emigrants) contains a facsimile of the correspondence between Stefan Zweig and Lasar Segall. Its price is R$60 and can be found in the lobby of the Lasar Segall Museum in São Paulo. In two articles published in the prestigious newspaper Frankfurter Allgemeine Sonntagszeitung, the critic Marcel Reich-Ranicki, known and feared for his sharp tongue, states that, in spite of a few literary “defects”, Zweig remains as popular as ever. The search for new guidelines by intellectuals, writers and other artists, following the radical experience of exile, was the theme of a symposium by the North American Society for Exile Studies, held in October and organized by Professor Reinhard Andress of Saint Louis University (SLU). The germanist Marlen Eckl took part, alongside scientists from various parts of the USA, Germany, Austria, France and Croatia. The start of the reforms of the house in Petrópolis is approaching. 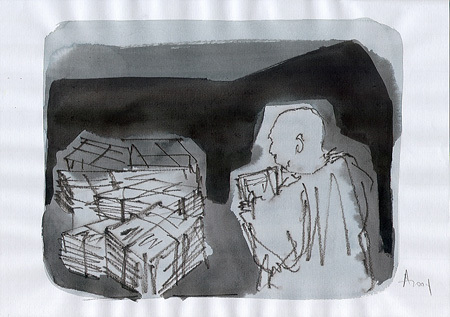 Click to see the new sketches. How did you discover Zweig? How was your interest in Stefan Zweig awoken? See text by student Bruno Felipe Rothbarth Decker, aged 25, graduate of the German Language and Literature course at the Federal University of the State of Santa Catarina. The future Stefan Zweig Center is being installed in Salzburg at Edmundsburg castle, high up on Mönchsberg, with a splendid view of the cathedral (photo), the castle and Kapuzinerberg. The building will also house the Center for European Studies of the University of Salzburg. 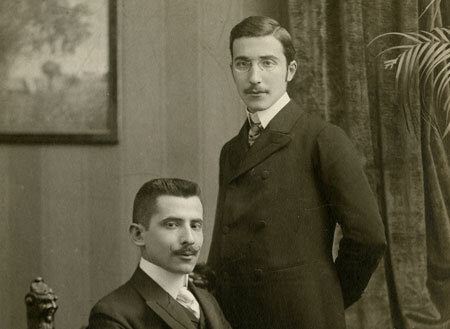 CSZ has a vast collection of photographs of Stefan Zweig and his time. See two photos of Zweig published on the cover of the magazine Aufbau (v. VIII, nr. 9 New York, N. Y., Friday, 27the February 1942), kindly provided by Renate Seib of the German National Library. Choose a lovely postcard of Rio de Janeiro in the 30’s, when Zweig visited Brazil for the first time. Welcome to the world of yesterday, today. To the magnificent land of the future which has never managed to solve its present. To the gallery of world builders, defeated heroes and victorious antiheroes. To the commotion of feelings, to letters from strangers and friends. To stellar hours and to moments of misery from which we learn so many lessons. Welcome to pacifism, although we are aware that the world is in a state of permanent war. To humanism and tolerance, in this world which is increasingly dominated by intolerance. Welcome to Casa Stefan Zweig, to meet the man, the writer, his life, his work and his legion of friends – from yesterday and today – and to share his ideas and hopes.